IS LONDON CITY SOFTENING US UP FOR FURTHER EXPANSION? HACAN East has produced a montage of photographs showing places, some of them many miles from the airport, where aircraft are lower than 3,000ft; and in many places less than 2,000ft. Because of the densely-populated areas London City planes fly over, it impacts more people than any UK airport bar Heathrow & Manchester despite being only the 14th busiest UK airport. 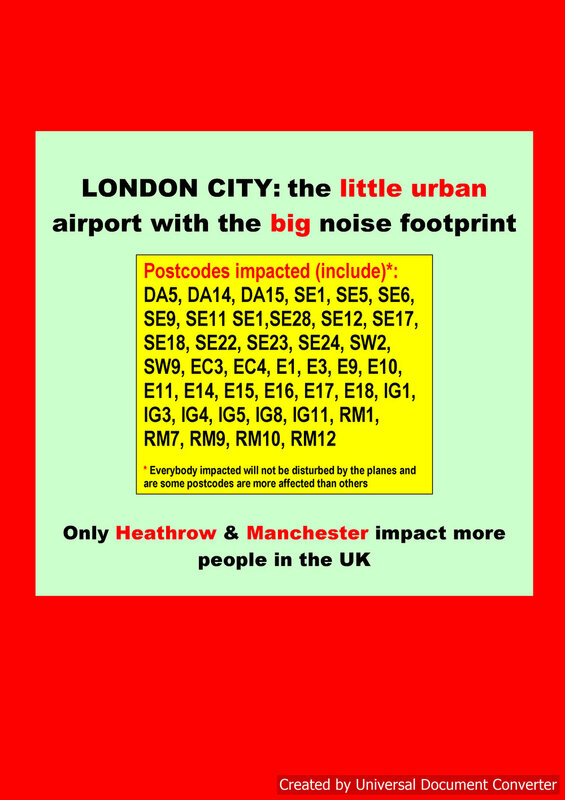 Astonishingly more people are blighted by noise from City Airport than from major airports like Schiphol, Brussels, Madrid or Munich. New figures compiled by campaign group HACAN East (26/03/19) shows that London City Airport impacts 75,000 people (see table below). That places it third in the UK behind Heathrow and Manchester. It affects more people than all the other airports in the South East combined excluding Heathrow. The figures are taken from the noise action plans which airports are required to produce every five years. The latest plans were released in early 201`9. London City Airport is to look again at its controversial concentrated flight paths. It told its Consultative Committee yesterday (7/3/19) that it will consult on new proposals later this year. This will be a wide-ranging consultation conducted under the new rules laid down by the Civil Aviation Authority. The airport will need to consult people on how they want the flight paths designed - for example, do they want pure concentration as now or do they want multiple flight paths which can be rotated in order to give communities a break from the noise. When London City concentrated its flight paths in 2016, the airport saw a fourfold increase in complaints. While some people did not get planes anymore, the communities over which they were concentrated felt the pain. Heathrow is consulting on the biggest changes to its flight paths since the airport opened in 1946. The consultation ends on 4th March. It could bring benefit to East and NE London. For the first time they could get a daily break from the aircraft. At present many areas are overflown all day long by Heathrow planes. That could change. A lot of places also get overflown by London City aircraft. They are not subject to this consultation but some of the changes proposed for the Heathrow planes could ease the burden on these areas. Heathrow Airport launched a major public consultation today. It runs for 12 weeks until 4th March. Runway alternation in West London will be cut from half a day to a third of the day to allow for alternation on a third runway if it is built. The consultation is asking for views on how this should be implemented. Significant changes to airspace are proposed to allow for vast swathes of London and the Home Counties, which currently get all-day flying, to get respite from the noise for the first time. It applies to both arrivals and departures. The night period when there are no scheduled flights allowed will be extended from 5 hours to six and a half hours. Views are sought on how this should operate. Heathrow is proposing to bring in 25,000 extra flights a year in the years running up to the opening of any third runway. On December 17th the Government published its Green Paper with proposals for its new aviation strategy which it will finalise and release in the second half of 2019. It is an important document. It sets out proposals for UK aviation policy until 2050. The Green Paper sets out to cater for the significant growth in flying it predicts will take place in the UK and around the world. It argues that this growth can take place without exceeding the UK’s aviation climate targets. It contains some welcome noise proposals that campaigners have been lobbying for over many years. The CAA report, released on 23rd October, which backed London City’s decision to concentrated its flights paths (see post below for details) also revealed the number of people who live under the concentrated flight paths. The overall numbers overflown before the flight paths were concentrated were of course much higher as planes were more dispersed but each area had fewer flights than people under the concentrated flights are now experiencing. If complaint numbers are anything to go by, there was much less annoyance. The long-awaited CAA report assessing London City Airport’s concentrated flight paths was released this afternoon (23rd October). It has backed the concentrated flight paths. Below is the press release HACAN East has issued. It includes a link to the report. Yesterday (October 10th), the World Health Organisation published its new noise guidelines. They confirm what local residents have been telling us that aircraft noise can cause annoyance, stress and potential health problems many miles from an airport. The new noise guidelines from the World Health Organisation, published 10th October 2018, are tougher on aircraft noise than previously. The World Health Organisation has found that when average noise is 45 decibels it can have health effects. Previous WHO guidelines argued that people could start to become annoyed by noise when it averaged out at 50 decibels over the day. This extends significantly the number of people impacted by either London City or Heathrow or both. There are no public figures for the number of people living within the 45Lden contours but, in the case of Heathrow, it is likely to extend to areas 20 miles, and possibly further, from the airport. That would include Greenwich and probably also the Leyton, Leytonstone and Wanstead areas as they get both Heathrow and London City aircraft. The 45Lden contour from London City would stretch less far but would include a much wider geographical area than the current 54LAeq contour which goes about as far as Blackwall. The World Health Organisation guidelines applies to all countries within Europe, not just those in the European Union but are simply guidelines. Their main purpose is to outline the health impacts of noise on the basis of the available evidence. The WHO does not expect the levels to be adhered to overnight as that would entail the closure of most airports and many roads. But, in due course, they should affect the policies of airports. HACAN East will be pressing for that to happen as soon as possible. The European Commission mandates that the 55Lden contour is used when drawing up Noise Action Plans. In geographical terms it goes as far as Clapham in London. Last year the Government published a report it had commissioned from the Civil Aviation Authority which found that people can be annoyed by aircraft noise at lower levels. Using London SE23 as an example, the paper aims to make clear to policymakers, campaigners and the two airports what the problems for communities are with the introduction of concentrated flight paths (City Airport) and separate development of the two London airport flight paths. Noise from arriving London City Airport aircraft combined with departing and arriving Heathrow aircraft blights thousands of south east London homes, with no respite. City Airport’s low altitude air superhighways, beginning in Feb 2016, have resulted in a perfect storm of aircraft noise for many SE London residents. Respite means scheduled relief from aircraft noise for a period of time. There are community noise hotspots in SE London that receive no respite from 6.30am to 10pm nearly every day of the year. The much-delayed report by the Civil Aviation Authority (CAA) into London City's concentrated flight paths is still not out. London City controversially concentrated its flight paths in February 2016. The CAA is required to assess its first year of operation. Its report was initially due out last year. The airport received a record number of complaints following the introduction of the concentrated flight paths. There has been pressure from communities, local authorities, politicians (including the Mayor of London) for them to be changed. Construction work has started on the work for a new taxiway, larger parking places for the planes and ultimately a bigger terminal and more parking. There has been some criticism from local people that the insulation on their homes to deaden the noise from the construction work, particularly the piling, has not been completed in time. The airport has acknowledged it is behind schedule but expects the speed of the insulation work to speed up. The airport has just released its Noise Action Plan covering the years 2019-2023 for consultation: https://www.londoncityairport.com/corporate/noise-and-track-keeping-system/noise-action-plan. Closing date for comments: 5th September. London City has started the process of revising its Masterplan. Most airports produce masterplans. They outline their aspirations for decades ahead. City has yet to decide whether to look ahead to 2040 or 2050. The airport has said that at this stage nothing is off the table including seeking to lift the annual cap on flight numbers (see story below) or even to seek permission to fly between midday Saturday and midday Sunday when the airport is currently closed. But it does stress it is all at a very early stage and no decision has been taken. It is also worth stressing that the Masterplan is an aspiration document. If the airport wanted to make any changes, it would need to go to public consultation and public inquiry where it would meet considerable opposition to the lifting of the cap or in any changes to operational hours. The boss of London City told the Press Association in a story published on 9/7/18 that London City may seek to apply to life the cap on flight and passenger numbers at the airport. Below is the press release issued by HACAN East and below that a link to the story. 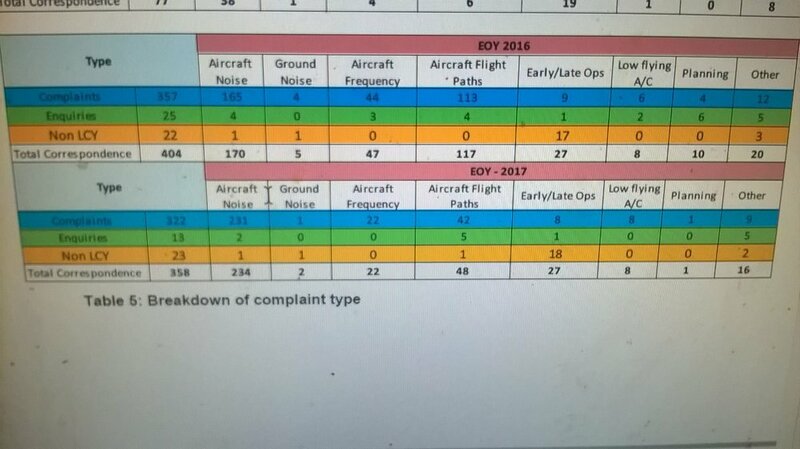 Figures released yesterday (9th March 2018) show complaints about aircraft noise continue to rise at London City Airport (see chart below). Higher in 2017 than 2016 and about five times higher than before the flight paths were concentrated in early 2016. Flight numbers using the airport, though, fell from 19,286 in 2016 to 18,205 in 2017 but passenger numbers were up. This is down to the use of bigger, fuller planes. 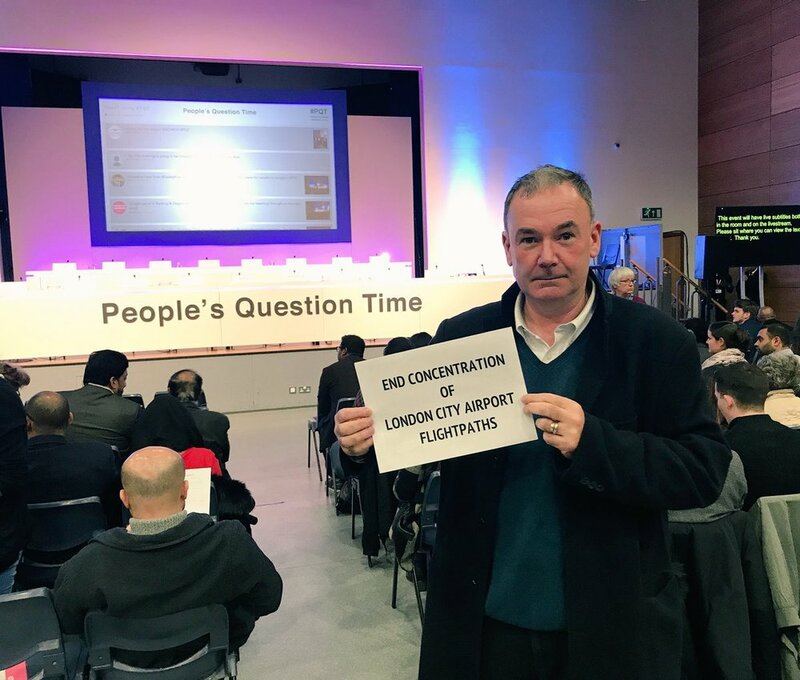 At the People’s Question Time in Dagenham on 2nd November there was cross-party support from London Assembly members to end the concentrated flight paths London City Airport introduced last year. 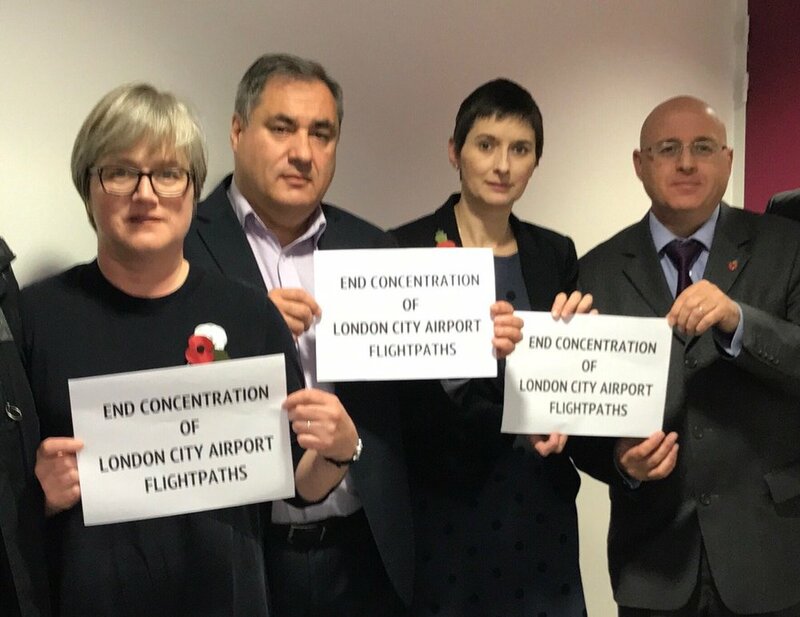 Caroline Russell, who speaks for the Greens on transport at the London Assembly, joined Conservative Keith Prince, the chair of the assembly’s transport committee, the deputy chair Liberal Democrat Caroline Russell and Labour’s Len Duvall in opposition to the flight paths (above). The local MP Jon Cruddas also backed the call for them to go (below). This was one in a series of People's Question Times held around London where the London Mayor, Sadiq Khan, and London Assembly members answer questions from the public. Below is an extract of a blog we have written. The full blog can be found on our blog page. I first remember walking along the North Woolwich Road in 1978, the year I came to London. The lively pubs my uncles – seamen from Scotland – had talked about were lively no more. Much of the area was on its last legs. The docks, which had provided so much employment for the area, were to close down just three years later, in 1981. Only people who have never experienced the pain of unemployment would dismiss lightly any development which brings jobs. As a boy I heard stories from an earlier generation of my family who had experienced the utter despair of not having a job during the Depression in 1930s Glasgow. It was this mission to create jobs and prosperity in East London that drove many councillors to back the expansion of the airport in the 1990s. It was a noble aim but it did leave a litany of broken promises made to residents about the noisy neighbour in their midst. So, three wishes as you move beyond thirty. 1. No further expansion – it is essential that the current cap on the number of planes allowed to use the airport remains. 2. No concentrated flight paths – the concentrated flight paths have created noise ghettos in areas across east and south east London. A solution needs to be found which provides some relief for the people of the noise ghetto. 3. No increase in noise and pollution – planes are becoming a little quieter and cleaner. The way to ensure residents benefit from that is to make sure that the current cap on the number of flights permitted to use it each year remains. And one more thing. Moving forward, no more broken promises? Campaigners from London City joined those from Heathrow and Gatwick air today to deliver a joint letter to Patrick McLoughlin, the Secretary of State for Transport, demanding a voice for residents in flight path changes which are expected to be introduced over the next few years. Campaigners have asked for a meeting with the Transport Secretary. The letter is not about new runways. There are differences amongst the campaigners on whether a new runway is needed and, if so, where it should be. The move followers anger from residents at the changes to flight paths which have taken place over the last couple of years. Protest groups have sprung up around Gatwick in response to the changes to both arrival and departure routes. The recent trials at Heathrow sparked a record number of complaints. And in East London furious residents staged public meetings at not being proper consulted about London City’s proposals to concentrate flight paths. The airspace changes are part of a Europe-wide programme to make more effective use of airspace and are now impacting the whole of the UK. They are designed to enable airlines to save fuel, to allow aircraft to land at and depart from airports more efficiently. In the UK Gatwick and London City have been earmarked as first in line for the changes. Heathrow is expected to have its changes in place by 2019 with national changes by 2020. Residents fear that the changes will result in excessive concentration of aircraft along selected routes. They are particularly critical of NATS (National Air Traffic Control) and the CAA (Civil Aviation Authority), the two organizations who are driving the changes. John Stewart, who chairs HACAN East, the organisation which gives a voice to residents under the Heathrow flight paths, said, “NATS and CAA are remote from residents. They plan these flight path changes in their hi-tec ivory towers. Our letter to the Transport Secretary contains positive proposals for flight paths that could work for both the industry and for residents. They involve providing all residents with some respite from the noise. HACAN is actively engaging with Heathrow to see what can be done. But it does require NATS and the CAA to play ball”.